Why not take advantage of your car being with us and have your car serviced or just washed ? 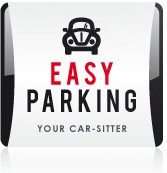 Easy Parking offers "à la carte" services for all your needs. Outside car wash 49€ : Hand-wash without water, fully ecological, cleaning of the rims and cleaning of the windows. Fantastic result guaranteed : your car shines like day one ! Inside car wash 49€ : dashboard dust treatment, interior and boot vacuum and cleaning of door surroundings. Seats and door panels renovation 125€ : your leather or tissu seats and door panels look like day 1... almost ! 80€ for driving your car to the garage (near the airport) and following up on the job. If you wish, we can drive your car to a designated garage of your choice : contact us for a quote. Easy Parking is only an intermediary mandated by its client for an intervention on his car done by a professional garage that has no link with Easy Parking.